Nobody likes it when the music stops, it’s even more heartbreaking when it stops because your beloved headphones have broken. But fret not, there’s a simple fix for that will have your headphones back on your head where they should be in no time. This guide will show you how to fix a pair of broken headphones. It is strong, flexible and durable! Give your headphones a quick haircut by chiseling them with a knife to remove any obstructions (if there are any). We found our headphones had a piece of broken plastic sticking out that was stopping both parts from meeting, and cutting this off ensured a close fit between both parts. Take out a wee blob and roll it into a neat ball roughly the size of a pea. Apply the Sugru to the (newly chiseled) broken headphone area, forming it into a pyramid-type shape. Now for the fun bit. It’s time to get squishy! Firmly press each end of the headphones together to compress the Sugru and get it to hold. 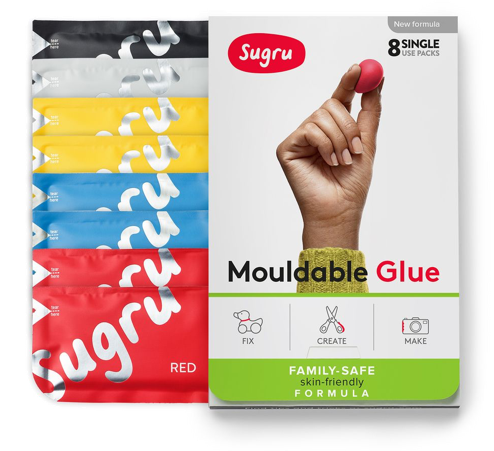 Your pyramid of Sugru should ooze over the sides. Flatten this excess Sugru and push it over the crack around the outside of the headphone band, joining both parts. To add extra strength and firmness, add another layer of Sugru on top in a sausage shape, and then squish down and flatten again. Now, leave your hacked headphones in a resting position to cure for 24 hours. The resting position must be one where the two broken parts of your headphones meet and can sit comfortably - allowing the sugru to bond as it cures. The photographed position works well. You may notice we have placed the cable between the earpiece and the headphone band here - this is just to separate the arm of the headphones from the earpeice and to stop the Sugru from bonding to the ear piece! If this techy fix has you wondering what other Sugru TECHnovation is out there, head over here to see.